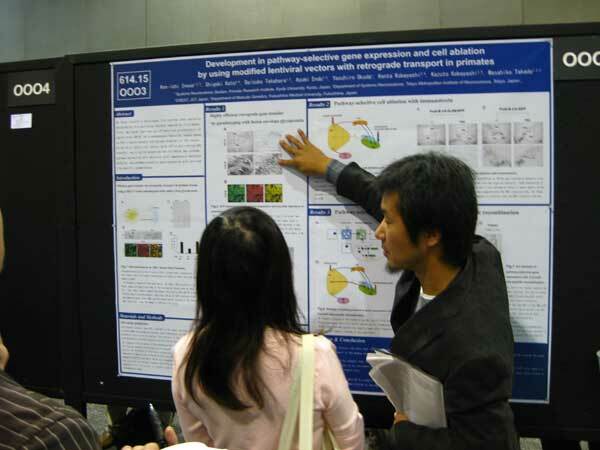 Participation and presentation in 40th Annual meeting of Society for Neuroscience and promotion of study in development and application of pathway-selective cell manipulation. SfN's annual meeting is the world's largest congress for neuroscientists to debut thousands of abstracts and to make network with colleagues from around the world through lectures, symposia, workshops, and poster presentations. 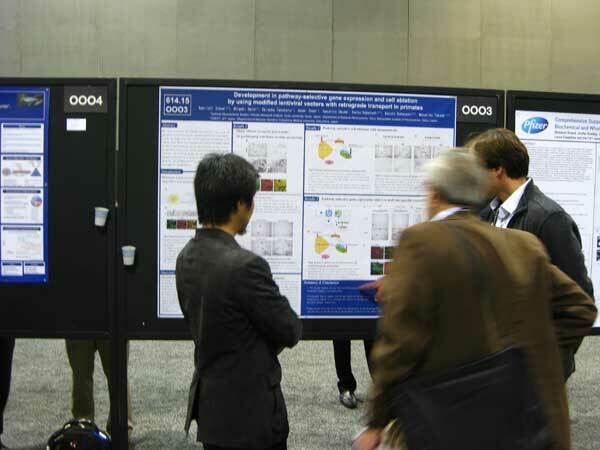 Neuroscience 2010, SfN's 40th annual meeting, is scheduled for Nov. 13-17 in San Diego, CA at the San Diego Convention Center, and thirty thousand scientists attended at the meeting. Under the aid of AS-HOPE project, I participated in the meeting and made a poster presentation entitled "Development in pathway-selective gene expression and cell ablation by using modified lentiviral vectors with retrograde transport in primates". Since many researchers, including Prof. Callaway and Prof. Richmond both of whom are leading of our research fields, had interest in our recent activities, I had meaningful discussions and obtained useful comments, especially about the application of the novel technique we developed. I also got many meaningful information about new technologies in neuroscience, gene therapy, and function of basal ganglia from other presenters.